Life’s An Adventure’s range of guided walks covers the country and this means you could be walking on a variety of terrain from soft sand to hard quartzite and from rocky tracks to open firetrails, so the big question is what’s the right footwear for each walk? The main reasons why you need shoes on a bushwalk is to protect your feet from rocks and debris, offer good grip, keep your feet dry (well… as much as possible) and be light enough to move easily. 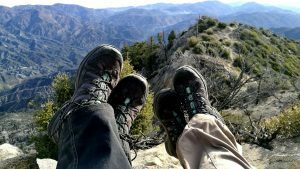 There are three types of bushwalking footwear: boots (one cleat below and one above the ankle which immobilises the joint), mids (one cleat below the ankle which prevents ankle rolling but not twisting), and lightweight shoes offering maximum mobility. So basically the heavier the load the more supportive your footwear needs to be. Carrying a full pack requires a full boot. Capeesh? However a Life’s An Adventure walk is a pack free experience, which means all you’ll need in your day pack is a jacket, a bottle of water and your camera. With this in mind there’s no need for a heavy pair of hiking boots – you’re just adding extra weight. On most Life’s An Adventure walks a sturdy shoe or lightweight mid-cut boot is all you’ll need. You’ll be saving weight and $$ as a pair of full boots can cost hundreds. Now, when we mean shoes we don’t mean something you’d wear to the office or to a disco (do people still go to discos?) but a pair of hiking shoes designed for the great outdoors. Mid-cuts offer the same features as above they’re just heavier and slightly sturdier but unless you were walking on rugged, rocky terrain like say the Larapinta Trail you really wouldn’t need them on a Life’s An Adventure walk. Even then, you could easily get away with a good pair of outdoor shoes on the Larapinta. Here’s one more tip, it’s worth bringing along a pair of sandals that you could put on when crossing rivers or streams – saves getting your shoes wet – and they’re great to change into after a long day on the trail. It’ll give those little pink toes of yours some time to be free. And here endith the lesson. Happy walking!